Trek Lit Reviews: Lots of Book News! New Discovery, Plus TOS Covers! Lots of Book News! New Discovery, Plus TOS Covers! Greetings, Trek book fans! We got a bit of a dump of Star Trek book news in the past day or so, so let's jump right in with a new book announcement for later this year! 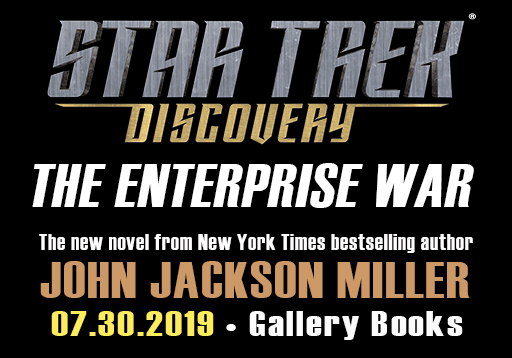 Coming in July 2019 from New York Times bestselling author John Jackson Miller is the next novel under the Star Trek: Discovery banner: The Enterprise War! Here's the announcement on John Jackson Miller's website. Promising to reveal what the U.S.S. Enterprise was up to during the Klingon war of Discovery's first season, The Enterprise War is John Jackson Miller's first Trek novel since his terrific Prey trilogy back in 2016. Definitely looking forward to this one! The Enterprise War is set to be released on July 30th of this year! Moving on to other new book news, we have covers for the two upcoming TOS novels! First up is The Captain's Oath by Christopher L. Bennett, due out on May 28, 2019. Christopher L. Bennett announced the cover on his own website as well. 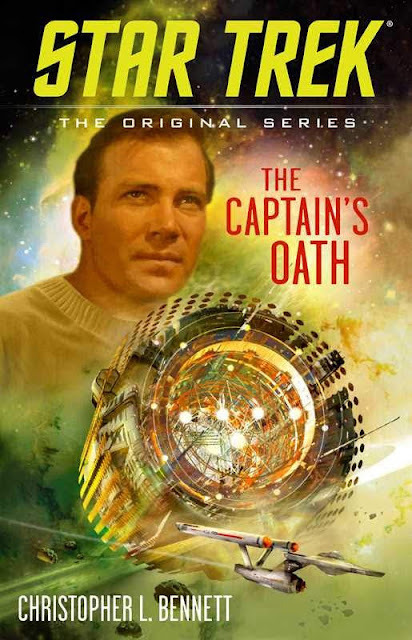 According to the author, The Captain's Oath will focus on Kirk's career before taking command of the Enterprise; specifically, his first command of a destroyer-type ship. Check out below for the cover, back cover blurb, and links to pre-order from Amazon! And finally, August 13th sees the release of another TOS novel: The Antares Maelstrom by Greg Cox. We have a newly-revealed cover for this one, and while the blurb has been available for awhile, I'll post it again below along with links to purchase from Amazon. Remember, using the links I've provided helps out Trek Lit Review in a small way, so I really appreciate it! The final frontier erupts into chaos as vast quantities of a rare energy source are discovered beneath the surface of Baldur-3, a remote planet beyond the outer fringes of Federation space. Now an old-fashioned “gold rush” is underway as a flood of would-be prospectors, from countless worlds and species, races toward the planet to stake their claim. The galactic stampede threatens the stability of neighboring planets and space stations, as widespread strife and sabotage and all-around pandemonium result in a desperate need for Starfleet assistance. 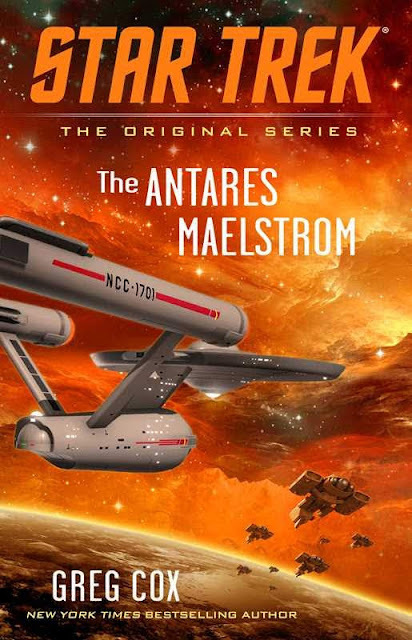 Captain James T. Kirk and the crew of the Starship Enterprise are dispatched to deal with the escalating crisis…which lies on the other side of a famously perilous region of space known as the Antares Maelstrom.